In collaboration with Information Builders, CGN Global has developed Smart-Edge: Next Generation S&OP application. Smart-Edge is an integrated planning platform that spans marketing, operations, engineering, and finance. 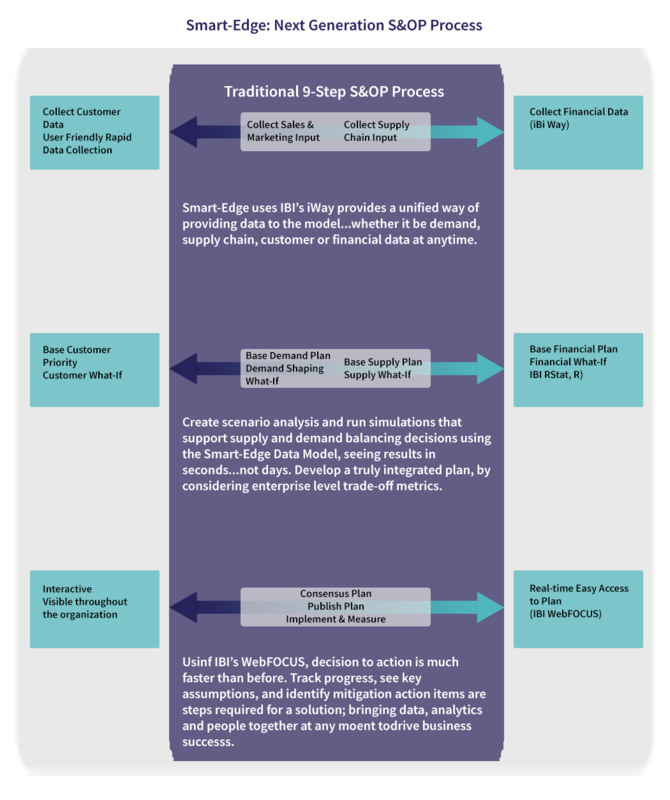 Using highly sophisticated mathematical analyses and optimization techniques, Smart-Edge enables users to investigate multiple production plan scenarios, evaluate enterprise-level profit, and assess the financial impact of demand shaping, surge capacity, and other what-if mitigation strategies. Manufacturers will better understand the risk associated with any potential plan and a gain a more holistic understanding of performance drivers, so they can boost profitability and supply-chain effectiveness. Powered by CGN’s subject matter and industry experts, as well as Information Builders’ cutting-edge iWay Software and revolutionary tool WebFOCUS RStat, we can provide you with the intuitive tools and unmatched knowledge to create an S&OP process above and beyond the traditional approach. To learn more about Smart-Edge: Next Generation S&OP, watch our COLLABORATIVE WEBINAR and view our PRODUCT FACT SHEET.